The Air Scrubber Plus uses certified space technology to purify the air in your home. This technology was developed using a variation of air purification technology employed by NASA to create a safe atmosphere for astronauts in space. The Air Scrubber Plus cleans, deodorizes, and purifies the air in your home at a level that no other product can. This air purification product improves air quality, making it an ideal choice for homes with allergy sufferers, animals, and kids. It can even remove the more pungent kitchen smells and the pollen Spring brings. Air Scrubber Plus extends the life of your heating and cooling equipment. 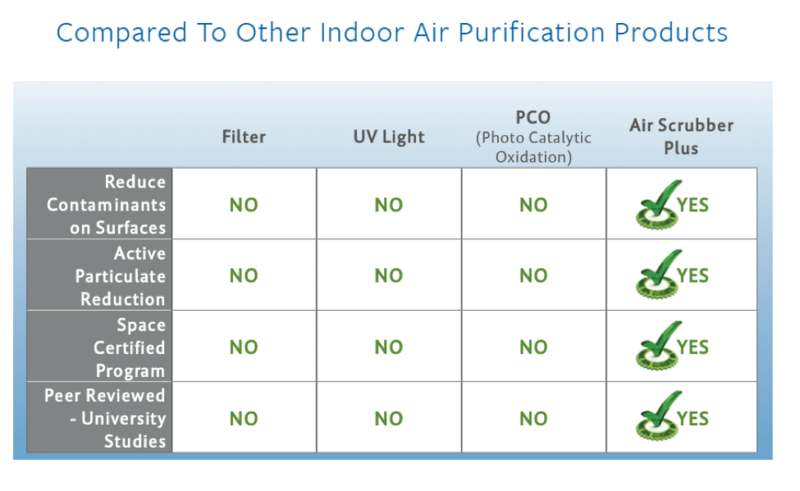 With the Air Scrubber Plus your home’s filtration system will filter out more contaminants and harmful particles than a standard pleated filter, providing better air purification and air quality. Call us today or watch the video below to learn more about this revolutionary technology designed to improve the air quality in your home.